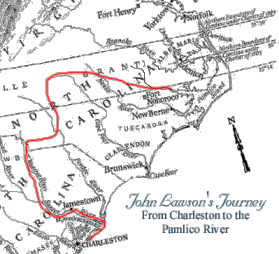 On December 28, 1700, explorer John Lawson — with a party of five Englishmen and various Indian guides— set out from Charleston on a journey through the backcountry of Carolina. In late January 1701, the Lawson expedition crossed into what is now North Carolina in the vicinity of present-day Charlotte. Various Indian tribes were encountered — including the “Esaws,” Sugaree and Catawba — and the explorers resumed their journey along the Trading Path, a route that stretched north and eastward through the interior of the province. In February, while most of Lawson’s party decided to travel straight to Virginia, Lawson and a companion continued their trek through Carolina. The route eastward led Lawson to Occaneechi Town, near present-day Hillsborough. At Occaneechi, Lawson met an Indian named Enoe Will, who agreed to guide the explorer to the English settlements along the coast, and on February 23, 1701, the explorers reached the English settlements on the “Pampticough” River, near present day Washington. The expedition lasted 59 days and covered about 550 miles through the forbidding Carolina backcountry. 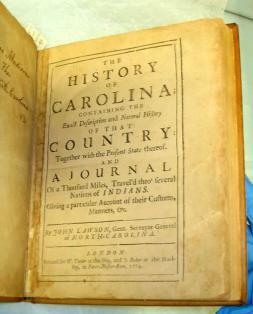 Lawson, with a keen eye for detail, recorded his observations and, in 1709, published A New Voyage to Carolina.